Let's talk showers. 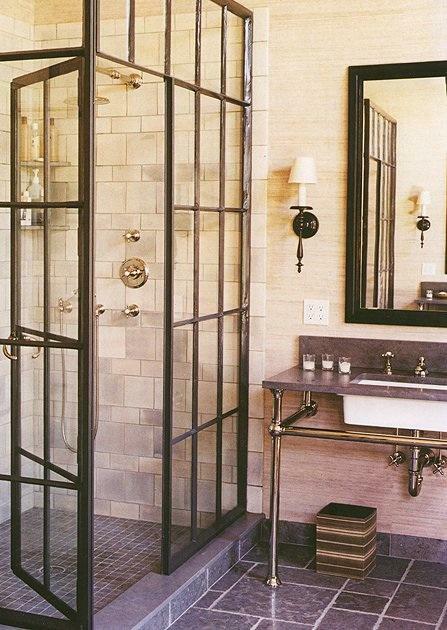 I'm all for a clean, frameless glass shower surround -- I'm a fan, for sure. But I pinned this photo months and months ago, and I cannot get it out of my head. I? Love it. Lurve it. Lah-oovve it. I've moved way past 'like' and I'm firmly in 'like like' territory. I'm schoolgirl-giddy. Steel factory casement windows used as a shower enclosure? It's so industrial. So unexpected. Almost urban and a little masculine... whatever it is, it's exciting to me. Then, stick that industrial, masculine shower enclosure in a bathroom with cottage touches and you hop right into juxtaposition land, my favorite place to visit! Those oversized honeycomb tiles, the rustic vanity... aaaaaahhhhh! (that was an angelic choir). I'm crazy for it, as in "your weird aunt that no one talks about" crazy. But cooler. Or something. It worked in my head. Long story short, factory window showers = fabulous detail in my world. What about in your world? I love those windows. They're one of the things I miss most about our old loft that was in an historic grocery warehouse building. Unfortunately they are a pain to maintain - especially where moisture is involved - and expensive to repair. Sadly I know this because our HOA tried to levy a $10k assessment against some of the loft owners to pay to fix the worst windows in the building - coincidentally, their own. I love the look, but would hate to clean them. Oh dear, you now have me scouring the internet for salvage yards that might supply me with something similar and contactingreproduction companies to see if they will take orders from anything less than a whole building-worth of window. Somehow a standard sheet glass shower enclosure just doesn't cut it any more!! Looks great, you have a great knowledge of style! Check also bet tips if you like sports! You know a lot about home design - you can find more in this blog!